Michael Franses is an independent scholar, the author and publisher of numerous books and articles related to the textile arts as well as co-founder of several textile-related organizations. In 1975, Franses co-founded the International Conference on Oriental Carpets, jointly organizing the first conference in London in 1976. That year he co-founded Hali, The International Journal of Oriental Carpets and Textiles, was the publisher and co-editor until 1986, and has since remained a consultant editor and regular contributor, becoming board chairman of Hali Publications, Ltd in 2009. Franses owned The Textile Gallery in London from 1971-2009, from a town house in central London and also exhibiting at major art fairs all over the world and mounting numerous special exhibitions. Since closing his gallery he has been devoting his autumn years to study and to putting his extensive archives in order and making these widely available. He was Director of Special Cultural Projects at Qatar Museums in Doha from 2011-2016. He has now returned to Europe and is currently working on a number of projects and publications. 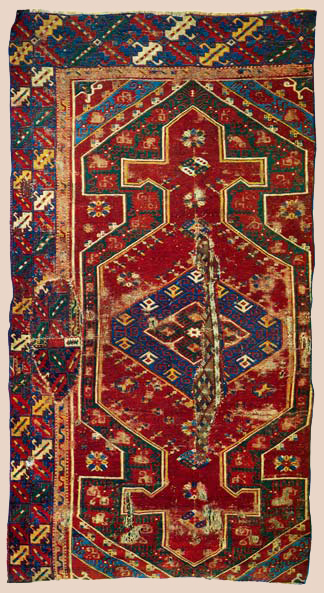 In 2009, Franses was honored with the Joseph V. McMullan Award, presented by the Near Eastern Art Research Center for his stewardship and scholarship of Islamic rugs and textiles. He has been chosen by The Textile Museum in Washington DC as the 2010 recipient of the George Hewitt Myers Award, one of the highest accolades in the field of textile arts. Metropolitan Museum of Art, New York, inv. no. 1974.149.9.